This article is an abridged version of a talk David Tong gave at the Southbank Centre in London in 2013. You can listen to a sound recording of the talk on Soundcloud, or watch a video of a very similar talk, aimed at 16 to 17 year-olds, here. 2015 is a special year for physics. It is the 100th anniversary of Albert Einstein's greatest achievement: the general theory of relativity. General relativity is a theory of gravity. In fact, it is the theory of gravity. In the one hundred years since its discovery we have not come up with anything better to replace it. It is the theory which explains why apples fall from trees and why we are all stuck to the Earth. But it really comes into its own when we think big. It explains why the Moon orbits the Earth, why the Earth orbits the Sun and why the Sun is one of a 100 billion stars orbiting a huge black hole that sits at the centre of our Milky Way galaxy. It is the theory that governs the dynamics of the cosmos on the grandest scales imaginable. 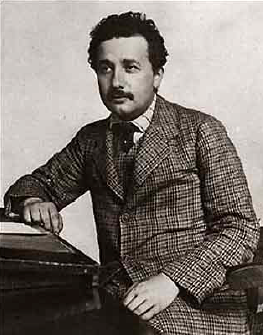 Einstein discovered general relativity in 1915 when he was 36 years old. He didn't yet have the celebrity status that he would later, but in scientific circles he was already a star. He had just been hired to Berlin where he held the most prestigious position in Europe, he was youngest member of the Prussian Academy of Sciences, he'd made many important contributions to science. But his general theory of relativity was to be by far his greatest achievement. It remains one of the greatest achievements in the history of science. The seeds for Einstein's theory of gravity were sown in 1905. I think it's fair to say that Einstein was a cocky young man at that time. He didn't have a position in a university, he didn't even have a PhD. The main reason was that he'd managed to annoy every scientist he ever met, usually with some combination of arrogance, laziness and rudeness. So in 1905 he was working as a civil servant in Switzerland, on the lowest rung of the ladder as a junior patent clerk in Bern. The good thing about this job was that it was easy. It left Einstein with lots of spare time to think about science. In that year Einstein wrote four papers. One of these was simply a very good paper and ﬁnally won him a PhD, but the other three each revolutionised an area of science. Special relativity put Einstein in conflict with a theory that was then considered the bedrock of science: Isaac Newton's theory of gravity which had been around for nearly 250 years (you can find out more about it here). Einstein wondered what would happen if the Sun were to suddenly explode. Since the Sun is so far away that it takes light eight minutes to travel to Earth, we wouldn't know about the explosion straight away. For eight glorious minutes we'd be completely oblivious to the terrible thing that was about to happen. 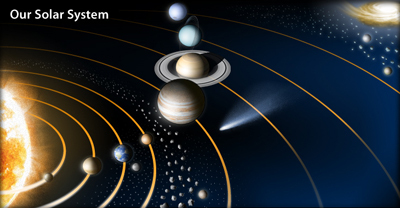 How fast does gravity travel across the solar system? Image courtesy NASA. But what about gravity? The Earth moves in an ellipse around the Sun, due to the Sun's gravity. If the Sun wasn't there, it would move off in a straight line. Einstein's puzzle was when that would happen: straight away, or after eight minutes? According to Newton's theory, the Earth should know immediately that the Sun had disappeared. But Einstein said that couldn't be right. Because, according to him, nothing can travel faster than the speed of light — not even the effects of gravity. In case it's not obvious, I should point out that Einstein was not a pragmatic man. The Sun explodes and all he worries about is whether the Earth travels in circle or a straight line. But this was how he did science. He would cook up these scenarios in his head and just push them to the limit. He'd try to find some contradiction and when there was something that didn't make sense, that's what he'd focus on. At first Einstein thought he could fix the problem by tinkering with Newton's equations, building in a time delay, but this didn't work. In 1907 Einstein started thinking more deeply about gravity, going right back to basics. It took him eight years to get to the final answer and, for most of this time, he was the only person in the world who cared about the problem. This was an exciting time in physics: the basics of atomic structure were being uncovered and it was the early days of quantum mechanics. Einstein was at the forefront of all these developments, but what he really cared about was whether the Earth continues to move around the Sun after it explodes. Einstein first thought he'd cracked it in 1913 when he came up with what he called an "outline" of the theory. He realised it wasn't perfect, but he thought it was basically right and just needed a little polishing. For two years he tried to ﬁx it up, but somehow he just couldn't quite do it — nagging doubts started to creep in. Things came to a head in the summer of 1915, when he went to the German town of Göttingen to give a series of lectures on his theory. In Göttingen, there was a guy called David Hilbert, who was recognised as the greatest living mathematician at that time. Einstein spent a week there and Hilbert took a great interest in what he had to say. When Einstein returned to Berlin two things happened. First, he realised that his theory was rubbish. The basic ideas were right, but the whole framework that he'd constructed was just wrong. Secondly, he got a letter from Hilbert saying "Well, I really liked your lectures, but I'm not really sure it's right. So I've decided to work on this myself". After eight years of working on his own Einstein suddenly had competition from the world's best mathematician. Einstein got depressed at first, but then he buckled down and focused everything on his problem. He worked for months, sometimes forgetting to eat or sleep. Eventually it got to November 1915. Einstein was due to give a series of four lectures — one a week — on general relativity at the Prussian Academy of Sciences, to all the brightest scientists in Berlin. He'd agreed to do this way back when he still thought he knew what he was talking about. But now he didn't have a theory. He managed to get together enough material to give the first lecture, but from then on, he was working in real time. During the week, he spent his time trying to solve the problem that he'd struggled with for eight years. At the end of each week he stood up and gave a lecture on what he'd just figured out. Meanwhile, Hilbert was breathing down his neck, sending him letters which showed that he was also on more or less the right track. Finally, in the week before his last lecture, Einstein cracked it. At the end of the week, he stood up at the Prussian Academy and announced to the world the general theory of relativity he had figured out just days earlier. To find out what happened next, read the second part of this article. 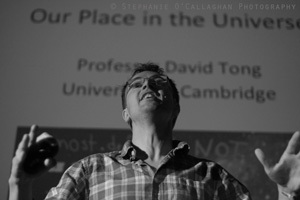 David Tong is a theoretical physicist at the Universiy of Cambridge. He works on quantum theory and general relativity. This article is an abridged version of a talk he gave at the Southbank Centre in London in 2013. You can watch a video of a very similar talk, aimed at 16 to 17 year-olds, here. A perfectly rigid tube is one light year long. A laser is mounted at the near end of the tube . The tube is rotated I revolution in 8 minutes, and the laser is turned on at the same time. The light will have travelled 93,000,000 miles, while the tube has rotated 1 light year at the opposite end, in 8 minutes. Please wait for the next version of Natural theory of relativity by Tahir. This has been called a "failure" of Einstein, but, it was his willingness to lie for the "establishment" that was no mistake, but a down right lie. Globally bent timespace doesn't cause gravity. Gravity causes globally bent timespace; just as does velocity in mechanics, current in electricity, and entropy production rate in thermodynamics, which is identical to polarity cancellation rate .. The entropy of the universe having been defined to be the proportion of photons to nucleons, and nucleons of opposite polarities cancel out into photons, shows that polarity cancellation rate is identical with entropy production rate. The Philadelphia Experiment showed that such current, which bent timespace below pi, causing probability transduction travel, didn't cause any gravity. The universe is like a shaken bottle of water. The water represents energy as the one substance. The bubbles represent the differentiations of energy in energy, in closed circuitry, that there be something to move out out of the way and fill in behind in the one substance, energy. The air represents energy as probability. The bottle represent the limitation of impossibilities. The shaking is the infinitesimal point nothingness, . , rastered by time into timespace, U, which exerts its oneness in one direction, /, thereby stirring closed circuitry, O, allowed by the rising value of pi from zero up, that all going the same way repels, X, forcing confluencies, =, thereby allowing undifferentiations back into nonexistence. The friction is facilitated by the Planck's volumes. Nothing can be smaller than Planck's volume. The infinitesimal point nothing is nothing. It can be seen here that that which has been called the "pull" of attraction is actually the pressure of all the repelling circuits, X, pushing into confluencies, =. This is the one force. The real opposite polarities are counterclockwise and clockwise. Counterclockwise, vO^, face to face, on clockwise, ^Ov, are confluent. The unions and thereby cancellations of opposite polarities are circuits merging to be undifferentiated, losing their individual existences, into individual nonexistence. I read "Natural theory of relativity" by Tahir online version on General Science Journal. Tahir seemed to have just trampled over our European Genii.